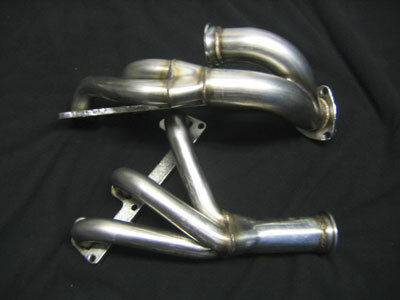 We are selling TWO different sets of stainless steel headers for 86-7 Turbo Regals. 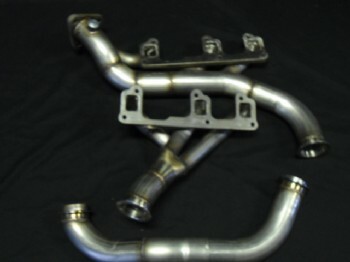 We have a 3 bolt turbo flange KB style headers AND a 3 bolt turbo flange SE style that fits with regular style downpipes. Very nice quality and the price is right! 1 1/2" primary tubes and 2 1/4" two piece crossover pipe. Tubes are made of 16 gauge 304 stainless steel. These bolt up nicely with the bolt holes lining up perfectly with the heads and ports. Includes driver and passenger side headers, 2 piece crossover, header bolts, band clamp for the crossover pipe and v-band clamps for the ends of the crossover pipe.Standard Felpro 1400 header gaskets and a turbo flange gasket are also included. NOTE! The KB headers can only be used with a downpipe that was designed for use with AFTERMARKET headers. SE style headers will work with any type of aftermarket downpipe that does NOT use the stock exhaust elbow. They will NOT work with the stock downpipe. IMPORTANT!! All exhaust on a turbocharged vehicle goes THRU the turbo! 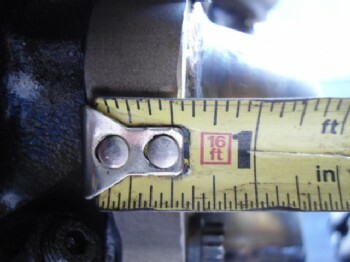 It is imperative that ALL headers be flushed out and checked for debris, etc before bolting on the motor and starting. We will not be responsible for any damage to your turbo due to debris. Flush with engine degreaser and water and blow out with compressed air and check for any welding slag that might have been missed during manufacturing. Check each tube and also the crossover pipe too. On a normally aspirated motor you can just bolt on headers and go but a turbocharged motor requires extra care and scrutiny when bolting on headers. The last thing you want is debris going thru your turbo! 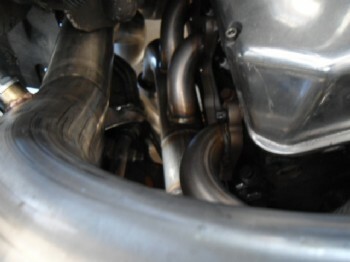 The crossover pipe on the KB style headers connects to the passenger side header right where a traditional downpipe is located. We also sell an external wastegate downpipe that works with the KB style headers. I have heard horror stories about aftermarket headers not even coming close to fitting properly so I installed these on my own GN to see how they worked out. I was very pleased when the gasket matched up perfectly with the flange and all the bolt holes lined up. Having never installed headers on a TR before I wasn't sure what I was in for but the installation went fairly easy. The driver's side pratically fall into place on their own. The passenger side can be a challenge but only to the point of getting the crossover pipe up to the connection on the header. Found that installing the down pipe into the motor compartment first was the best way to go. I did have to slightly bend the transmission lines out of the way as they were up against the crossover pipe but not a big deal to do. Can only be used with downpipe designed for use with ATR / Kenne Bell type headers or our external wastegate downpipes we sell. Turbo installed before heat shield is put back on. 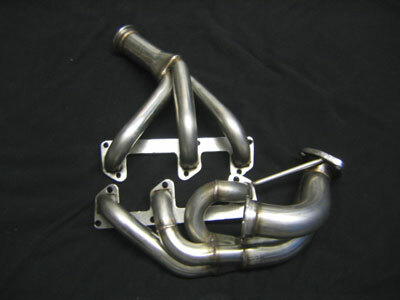 We are selling stainless steel headers for 86-7 Turbo. The 3 bolt turbo flange SE style is of nice quality and the price is right! 1 1/2" primary tubes and 2 1/4" two piece crossover pipe. Tubes are made of 16 gauge 304 stainless steel. These bolt up nicely with the bolt holes lining up perfectly with the heads and ports. Includes driver and passenger side headers, 2 piece crossover, header bolts and v-band clamps for the ends of the crossover pipe.Standard Felpro 1400 header gaskets and a turbo flange gasket are also included. 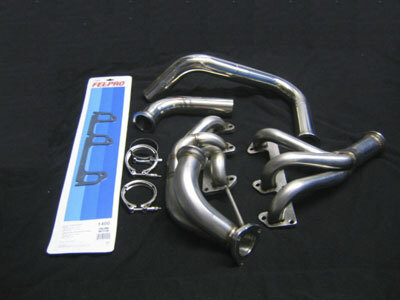 SE style headers will work with any type of aftermarket downpipe that does NOT use the stock exhaust elbow. Remember! If you are ordering KB headers you MUST have a downpipe that was designed for use with aftermarket headers that have the crossover coming up into the motor compartment! NOTE! Will NOT fit 14 bolt heads! Sold in pairs only. Always a good idea to have a spare set on hand. These will also fit Kenne Bell and ATR headers. Order from drop down menu in the order box below.